Folding bikes are icons of sustainable transportation, and of great personal interest to me. We grew up in the transport-deficient south-east London suburbs, and a folding bike was very handy. My Dad had a couple of Raleigh RSW folders with small balloon tyres in the 1970s (see right) – they were too heavy, folded badly, and not really very workable. I snapped the front fork on a grey 3 speed one. I also had a purple Raleigh 18 as a teenager in the 1970s. 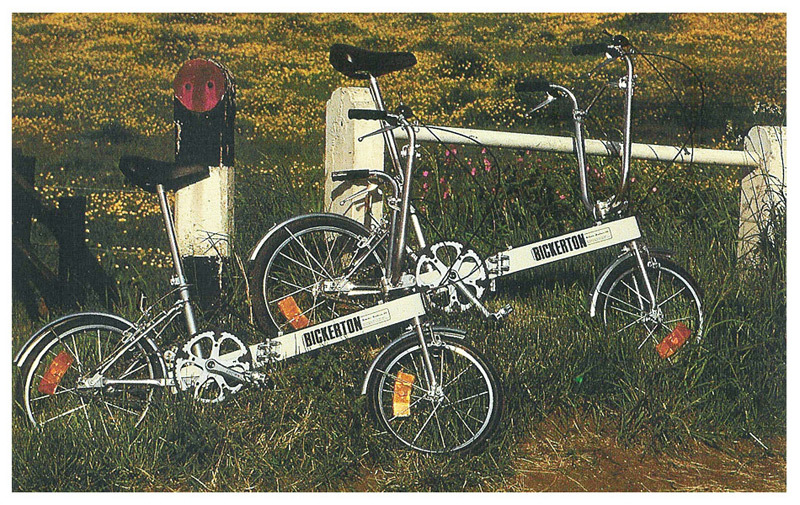 We also had a Bickerton, the extremely lightweight 1970s aluminium bike that tended to bend under stress, collapse, and even break under duress (left). I inherited that one, and broke it in the 1990s. Since 1995 I have had an R&M Birdy (photo right, mine). I bought one of the very first Birdys , and now own two more. The point of all of these bikes was to allow some degree of portability and thus more flexible use. In the rather small world of folding bike enthusiasts, there is a never-ending search for the ‘gold standard’ – a bike that weighs very little, rides comfortably and fast, and folds up nicely so you can store it easily in a building, on a bus, train or in a car. Folders require more technological ingenuity than a ‘cumbersome’ but the big money in the cycling industry has never really supported them – folders tend to be the domain of a few eccentric shoestring designers, and also some larger companies based in China or Taiwan than have a mix of cheap and passable designs for the global market.There are some top-end models produced by these bigger companies, currently dominated by Dahon and Tern (my Dahon Jetstream SP, like the one on the left, is passable). But purchasers with money to spend on a good folder (currently, let’s say US$1500 or so minimum) have been, for two decades or more, attracted by R&M’s Birdy and the Brompton. For supporters of these two machines, every other brand is a distraction. Both were designed by backyard budding engineers with scant resources. Andrew Richie (photo, Wiki Commons) borrowed money from 10 friends to get his 1976 Brompton prototype into operation, but by 1982 had ceased production pending a further capital injection. Alex Moulton and Harry Bickerton were the other lone British bike inventors (the Bickerton was a particular influence on Richie, who thought he could do a better job). Moultons do not fold. The Birdy was built by 2 students in a garage in Germany in the early 1990s and released in 1995 (video). In the last few years, Brompton have been winning decisively in the marketplace. I move between countries a fair bit, and I see far more Bromptons now in London and the UK (understandable since the bikes are made there), Australia, Belgium, France and even in the USA. A Birdy is a rare sighting even in Berlin, where I went in 2015 expecting to see this German brand (sorry guys-more Bromptons there). 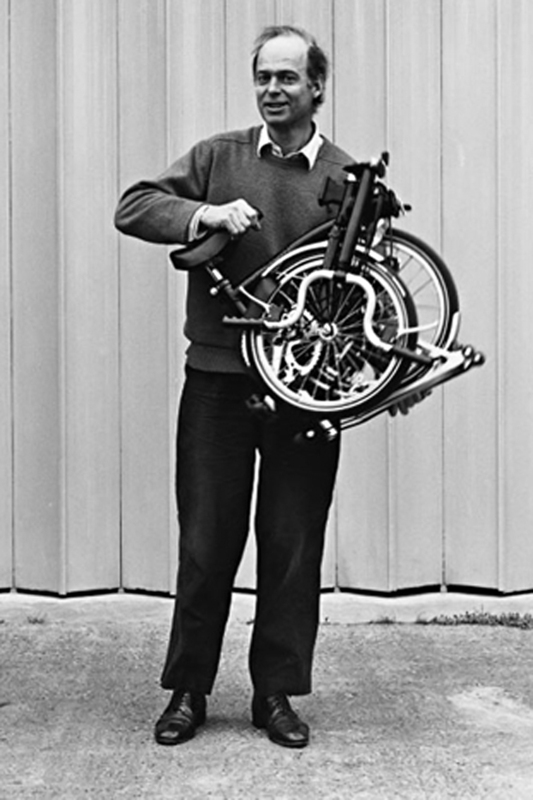 The success of the Brompton is due in part to marketing and supply – after a rocky supply chain since the mid 2000s they have become very efficient in their London operation, while R&M, based in Germany, have made some effort to supply outlets in important western world markets, but with less success except Japan and parts of SE Asia and Taiwan. Discussion of the changing market for folders can be found at AtoB magazine, who in 2015 ran a series of articles comparing folders in different price bands. You would think that the quality of the bike itself would also determine consumer choice, not just the ease of purchase and the supply chain. If anything, quality should be the main determinant of market success. But I am unconvinced this is really true, as is Dave Henshaw in AtoB whose articles include reliable bike testing. I think Bromptons are rather like Apple products – they are good but they also encourage loyalty and lock-in. Like Apple, Bromptons have a lot of unique parts. And customers return, sometimes to trade in for a superior model after a few years. They rarely choose to swap to anything better, including a Birdy. I don’t know enough Birdy owners to say if the reverse is true, but it probably is. In my view the Birdy is a far superior machine, but it is overpriced in some countries and has lost the marketing battle with the Brompton. The debate on their relative merits has been hashed out online a fair bit, but here is my perspective. On quality of build, both bikes were not so great back in the 1990s when the back end and stem of a Birdy would get stress fractures in the aluminium, and so would Brompton handlebars (earlier in time). All this has been ironed out – current Birdys, particularly the MkIII are built to last, and with standard headsets, derailleur gears and cranks, even disc brakes, that you can source almost anywhere. Brompton bits, however, are a bit more specialised since many are made in the factory and the firm does not like outsourcing more than necessary. In terms of gears, Birdys have far more, up to 11 speeds on the standard models and even a Rohloff option, and the standard derailleurs work well. Brompton relied on a narrow Sturmey Archer hub for its 3/5 speeds (5 speed gearchange not always good), then used SRam after SA went bust in 2000, now offering a mix of 3 speed hub and 2 derailleur options, very inferior to the Birdy (rode such a 5 spd Brompton for a week in 2018 – hated it). Hub gears don’t get grime in them, but changing the back tyre is more tricky and a lot of fuss is made about getting gear ratios right on an odd 2 lever system. They also have 2 speed and single speed models, but nothing beats a proper gear range with the least friction. On suspension, always desirable on a bike with small wheels, the Birdy is the gold standard. The front suspension is no-dive and pretty unique; the back is similar to a Brompton. The Birdy wins hands down with its dual setup. Having no front suspension on a Brompton has predictable effects on rough roads. On speed, all my trials – and others except AtoB’s downhill rolling tests- suggest the Birdy is the clear winner. You can put slick tyres on both which make a huge difference with small wheels, but the Birdy is light and with its gear range it pulls away uphill. Weight is about equal between the two, say 10.5-12.5kg on average, and both have or will have titanium options and so-on that most people cannot afford. Both can go down to 7-8kg if you have money. The Brompton is made of steel, the Birdy aluminium. On luggage, the Brompton is better – it has a special bag. You can adapt those to a Birdy or get panniers front or rear, but most will not bother and just use a rucksack. On folding up, the Brompton is better (smaller) although not necessarily quicker – I can fold both in the same number of seconds. On the Birdy you have to get the gears and pedal in the right places before starting, and the package is bigger (MkIIIs are smaller than before). My summation is that if you want to go fast in a city or a rural environment, buy a Birdy. You can go for kms before you get tired and the engineering is fantastic, especially if you are tall. The handlebars adjust up and down on a Birdy – not on a Brompton. The disadvantage is the folded package size, the creaks you often get from the suspension, and needing to tighten things up if you are heavy like me. I think the Birdy is undersold. It is not in enough shops. It could be that the company needs to innovate its supply chain and list of models, but it looks like they do release attractive new variants. A major supplier in the US, NYCEwheels, pulled out from stocking Birdys and then promoted only its Bromptons. The change in language when this has happened in 2014 is interesting, and perhaps this is replicated elsewhere. Initially they promoted and sold both machines, and branded the Birdy as an excellent deluxe option , saying “If you want high performance in a compact folder, the Birdy folding bike is the best choice” (see their archived comparative review here). Then it is was about the Brompton [until in 2016 the Birdy came back and the language changed, but stocking Birdys did not last long!]. A similar thing happened in Australia with St. Kilda cycles and also the defunct Cheeky Cycles in Sydney, but now St.Kilda in Melbourne are also selling Birdys again. Velo Cycles in Melbourne say that if they stocked Birdys they would sell only 1-2 a year – but their 3 speed Bromptons are now up at AU$2000. For less than that you could get a 9 speed Birdy at St.Kilda Cycles across town when I wrote this in 2016- I have one of those -customers would do best to try both. Anyway as I travel the world with Birdys, I have concluded I will stick with them. You can go fast and in comfort. Take-off speed is excellent. Speed is less important at my age, but effort and comfort, with those bigger wheels, full suspension and adjustable bars, does matter and Bromptons just do not have those things. I have in any event, after 40 years on folders, probably saved thousands of dollars in public transport fares, hundreds of hours in waiting and walking times, beaten transportation strikes and carriage restrictions on trains, trams and buses, and intrigued a few university students who see the Birdy propped up against the lectern every week. I am not one of those academics that drives to work to then lecture about sustainability. Postscript Oct. 2015. Early in September I was hit by a large truck doing 50-60km/h when riding my Birdy in Melbourne. I was in hospital for almost three weeks. The Birdy was caught under the truck, I did somersaults along the road, but survived. No more bikes of any type for me for a while. Too many fractures. The whole story is here – it is remarkable. I think the Birdy has survived, the seatpost is bent, I have to take it to a specialist. May 2016 Back in action (bike, new seatpost and me)! March 2018 I noticed there is now a 2017 review on Cycling UK’s website that reaches similar conclusions here. However at the moment R&M are not doing themselves any favours by canceling the cheapest World Birdy Sport model (below), reviewed here, for 2018. It has gone. The company say they are still committed to the Birdy, but the prices keep going up and models keep changing. I managed to get a secondhand 2000 24 speed SRAM mark 1 in the UK for £285 and it came with various handlebar stems. Spares availability is getting dire. I also have an old early Mk1 model with missing pins for the handlebar stem – here is the solution from a German Citroen dealer! AtoB have now published their long-awaited “folders over £500” special feature and you can download a PDF from here soon http://www.atob.org.uk/. Or better, subscribe electronically or by mail. It is a disappointing read for me. Much crowing about the Brompton’s market dominance. Inaccuracies; prices between the two bikes are at parity in some overseas markets, as I show above (by actually going to those shops in Australia); and I think the German inventors were just as eccentric and lacking supporters as Andrew Richie! No discussion of the Brompton’s desperate search for decent gears and ratios over the years, its lack of front suspension and smaller wheels, or the non-adjustable handlebars. Or the fact that you can pick up either, not just Bromptons, secondhand to beat the stiff new prices. The Birdy Light’s weight is published clearly here at 10.8kg, not 11. And “Once these fundamental design parameters had been fixed, there was no easy way to upgrade the bike”. This is completely wrong. You can change the wheel size – I have a Birdy with Brompton wheels for instance- and of course the entire frame was re-engineered some years ago, thus changing the design parameters. AtoB do admit grudgingly that the Birdy might be good for long distances, but that is the only positive comment. I guess if you have to defend the Brompton’s steel frame as they do, the Birdy has already won the day as the best bike. It all boils down to marketing; in 2006 you could try both in a bike shop, now that is increasingly difficult, so the Brits choose Bromptons. Before reading your post, I stumbled over the mentioned atob article and also found it lacking in balance. My take on the Birdy vs Brompton debate is the following but at the outset I’d like to make it clear that I’ve been riding a S6R Brompton for 8 months now (daily commute of 5 km each way, weekly trip on a train, occasional 50-80 km rides) whereas the sum total of my Birdy experience was 30 minutes, last friday, with the Speed disc variant. Overall I preferred the ride quality of the Birdy, especially over cobblestones. With my Brompton it’s a almost literally teeth shattering experience, the Birdy handled them well. Gearing wise the Ultegra 9-speed of the Birdy was a little better than my 6 speed Brompton, and a lot more convenient in use. Braking was A LOT better on the Birdy, thanks to the discs. Where things head south for Birdy are in the areas of compact folding (if space is really at a premium, nothing beats Brompton imo) and especially, pricing. The owner of the Birdy I rode informed me that it cost about 2500 EUR. That’s..well..a lot of moolah to part with and there are not many dealers (maintenance…). Otoh, parts for the Birdy are more standardised, it drives me nuts that almost every single part of the Brompton is proprietary. Right now I still need the Brompton’s compact fold, when I finally stop alternating between my house (weekend) and my apartment close to the office during the week I’ll take another hard look. Thank you for your post, I found it very instructive! I bought a Brompton recently but swapped it very rapidly for a Birdy. Reason – newly top dressed roads near home the handlebars vibrated and flexed in a dangerously uncomfortable manner. I complained to the shop who agreed but said they still sell more Bromptons because of the small size. I love my Birdy. I think it’s portable enough. It rides like a real bike and my hands and wrists do not suffer as they did on the Brompton. Brompton marketing wonderful but the product seemed to me not fit for comfort. I have both Brompton and a Birdy, and have done since the millennium. Brompton is my choice for journeys in the UK utilising InterCity type trains (where pre booking (often just before departure) is required most times), as it folds smaller and neatly, and is easier to carry than my Birdy. I use a titanium Brompton. However for local trains where folding is rarely needed (sometimes on a full train it is kinder to others to fold the bike) the Birdy is great, and it does ride nicer. Mind you, living in Yorkshire I am fortunate to not only live in “God’s own Country”, but within striking distance of Cycle Heaven of York. Their York Station shop stocks both Bromptons and Birdys (‘other brands are available too!’) and have a variety of models to look at and try out. Cycle Heaven index!! Thanks. My parents live in Bath UK so both bikes were accessible and repairable at Avon Valley Cycles too. In Melbourne Australia where I usually live, there is a folder/electric specialist, Velo Cycles, and St Kilda Cycles which stocks both. Interestingly, Birdys are currently cheaper in Melbourne than an equivalent Brompton. Not sure why, perhaps closer to the manufacturer. let’s see if the balance is tipped. A couple of folding pedals on a Birdy works wonders for travel, and I have one with Brompton wheels and brakes, which is still rides better than a Brompton. A>B magazine, which I love, provide a rather nationalist account of the relative success of the Brompton in the UK that I object to. I am currently in Brussels and here, where both bikes are available, the word on the streets is rather that Bromptons are simply “à la mode”. Which seems to be true, because trying to climb up the hills on a 3 speed Brompton, the most popular model, is not fun! I live in NYC across the street from NYCE wheels where I bought my Dahon speed 8 about 4 years ago. I was, until reading this, looking at a brompton because I like the idea of taking it on an airplane. And in NYC I like being able to take the bike into stores and restaurants. I also like going fast and parts of my commute are a touch on the rough side. And I do from time to time go on 20 mile rides. So I’m now seriously considering the Birdy. My only reservation about the Birdy however, is its folded size. Can a Birdy fit into a hard travel case? Is it reasonable to think about taking it on a plane? (R&M are not that great about having full info in English). Potholes and rough roads are definitely better on a Birdy than a Brompton , and you can move the stem up and down to suit your body (cannot on a Brompton). For travel, yes it fits in suitcase – I have done that – but generally I put it in a soft bag (which came with the s/h bike I bought). One aftermarket improvement is to fit easily removable pedals like on some Dahons – pull off one pedal and the package becomes 7cm narrower. It looks like they still make you buy them yourself though. Mine were 40 Euros. In Brussels recently I talked with a guy who brought his into a restaurant – not a great problem. Simon thanks so much for taking the time to write that. I’m in Sydney and currently ride a Moulton TSR30 and I ride it in a sporty way, the way a Moulton should be ridden. Often I find myself needing the compactness of a folder and have often debated between a Brompton or a Birdy. While I prefer steel for bike frames after reading your page you’ve confirmed what I suspected: if you are a sporty rider the Birdy is far and away a more rewarding ride than a Brompton is. Also being a Moulton rider I think suspension at the front is essential with small wheels, another tick for the Birdy. I got knocked off in September but it was not the Birdy’s fault. At some point I will take it to the hospital and see if I can get going again, slowly! Thanks for your post. I ended here in my research to buy a Birdy or Brompton or a Tern Verge S27H. I am visiting Berlin right now and had a chance to test ride both bikes. I also agree with you that the Birdy has a more stable ride. The Birdy Rohloff is an engineering master piece. I would take that model back to Los Angeles if I choose to buy a Birdy as they are hard to come by in the States. My question is toughness and reliability of the Birdy as it seems a bit over engineered. What are the most vulnerable parts? The rohloff parts are avilable in California. I live in New York and am planning to go to the uk and Germany. Would you mind telling me in what shop you tried out the birdy? Im currently corresponding with a shop in kent about a 24 speed birdy dual drive. 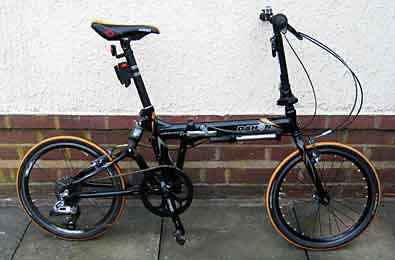 Incidentally, while waiting for my dahon to be repaired I rode a Brompton to and from work for about 3 weeks. The bike felt solid all the way around but the ride was in the rough side. And so I hope to get a birdy while in Europe. I checked out these three stores to a) check the bike as I always have follow up questions when leaving the store and do not want to look like an idiot when going back several times 😜 all stores are very helpful. No pricing flexibility in Germany. Delivery can take up to six weeks if you want a special color. B) check how to get back the VAT Tax of 19% when exported to the USA. This is a huge chunk of dough when buying a bike that cost several grand. Two options you get a tax free voucher form from the store. When leaving the country check with German customs at the airport who stamp and confirm that article was taken out of country in new unused condition. Then proceed to the refund counter where they will give you the tax Bank. Another option is NOT to take possession of the Birdy in Germany. The store exports the carton with the birdy via DHL To your address in the USA. In this case there is no VAT and no hassle at the airport. Here are the stores I checked in Berlin. Do you know if you have to pay duty in the US? Thanks for a really good and balanced review. If you want the best bike that folds to a compact size buy a Birdy. If you want the most convenient foldable package that opens up to a rideable bike, buy a Brompton. If your priorities are having the fastest fold and a decent ride, buy a Bike Friday Tikit. If buying a Birdy, seriously consider the cheapest model. You get most of the benefits and lighter weight at much lower cost. The first non essential upgrade should be Kojak tires. For traveling around town and stopping at shops, or handling a folded bike, a small backpack is far more convenient and far less costly than panniers or bags that attach to the bike. Sorry to hear about the truck! I have invested in a birdy after reading your article. I too found this review and the subsequent comments very useful in coming to a choice of bike. I was able to try out both from a UK store which was very helpful. I fell in love with the Birdy for all the obvious reasons and enjoyed the ride – it was the Rohloff so a bit spoilt. I thought when I arrived at the shop for the final time that I was going to buy the Birdy but ended up with a Brompton at the last minute. I don’t regret that decision and am getting full usage from it. Although the ride on the Birdy is better it is not so much better and some of that was due to the Big Apple tyres. The Brompton is surprisingly good. Cobble stones and mud do defeat it but not much else. In spite of all advice to the contrary, I swapped to the standard suspension (I am around 67kg) and it became a new bike. The difference in comfort was enormous. The ability to take it on the tube to London – hop on and off the trains – and take it into shops and restaurants can’t be bettered. A folding bike is for folding I decided and that was the most important thing to me. I have the six gear version in standard configuration and at 68 years old find it no problem to get up my steep drive and the equally steep hill opposite. All that said I am still in love with the Birdy too ( too fickle to be faithful to just one!) so I will probably get a Birdy too and use the two bikes for different purposes as outlined in the comment above. BTW I have taken the Brompton on the train to Marylebone and ridden it along the canal to Limehouse, through Wapping (cobbles were a little challenging), over Tower Bridge and along the embankment to Greenwich where I had lunch at Zizzis with the Brompton neatly under my table. It is all about horses for courses to my mind. The Birdy is undoubtedly more sophisticated and gives a better ride, but in many situations the Brompton is just so much more practical and lots cheaper. The weight is about the same – the Birdy hub gear models being slightly heavier. Thanks. Not sure about ‘cheaper’ though – mad exchange rate fluctuations are making Birdys cheaper in some countries. Birdy City £2069, basic Birdy World £1100 but no discs, derailleur 8 speed and no lights, heavier and no Big Apple tyres;. Brompton 6 speed 2017 £1040 and £100 less for last year’s model. I still think they are both good bikes but for different purposes. When I looked at the two folded side by side, that’s when I made my decision. I will get a Birdy sooner or later but not my first choice for a go anywhere folder. Melbourne Australia: Birdy 9 spd $1,599.00 [2015 model], current disc brake version $2,299.00, Brompton M3L $2,299 – St Kilda Cycles. Well that is interesting. Of course cost is a bit of a red herring anyway when it comes to the merits of a particular bike but it certainly makes a difference to affordability! It shows how your views can be clouded by where you live. Simon thanks for a great review. I need to commute 6.5 miles each way. Can it be achieved comfortably on a birdy, for 15 stone man with rucksack ? Whatever makes a normal bike comfortable for your journey applies equally to the Birdy,and with the Birdy you can fold it for public transport (thereby reducing the impact of bad weather on occasions) and eliminate security issues by carrying it inside the building as well. Assuming it’s properly set up for you and your commute I would expect you to have some difficulty finding another bike which provides comfort that surpasses or even equals a Birdy. If you can ride a given commute on any other bike, you should have no problem on a Birdy and weight should not be an issue assuming the rucksack weighs more like 20lb or less rather than 50lb. It will accelerate quicker and be more agile than a standard bike but don’t expect to ride it hands free. I would love to see a comparison between the Birdy and an Airnimal. I’m not sure if Airnimals are very much known about outside the UK. I certainly see a few Joeys and Chameleons in London, and no doubt a few readers of your blog have experience of them. I know that because they have bigger wheels than Birdys they don’t fold down to such a compact size but I gather that the riding experience is a good one. It is. Somehow they have not reached a wide audience. 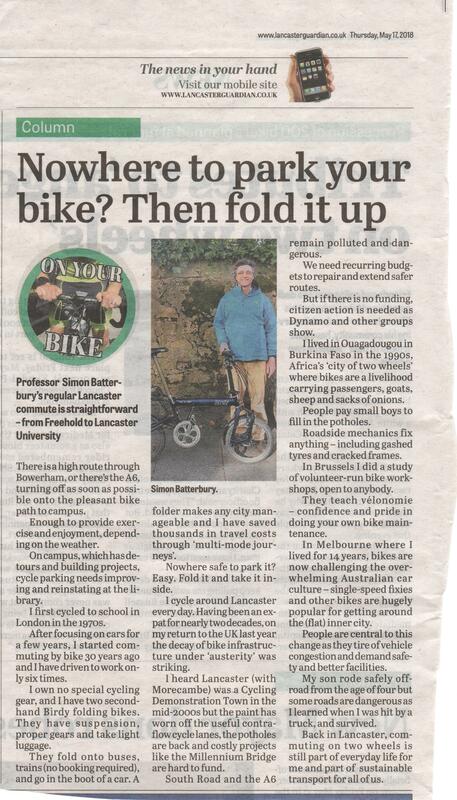 Great article, confirms my toughs and why I chose a Birdy over a Brompton back in 2008 and done thousands of kms with it, mostly commuting. I ride in Lisbon: very hilly town with lots of rough road, sidewalks… I’m also into sports and I like to ride fast. Chose the city version with the 8 speed nexus hub. I could never go Brompton because of the gears they had at the time. I need to climb steep hills or against strong wind and also ride fast. I might want the Brompton if I lived somewhere with very smooth cycle lanes and very flat, that way I could pick the “faster” tuning. I think Bromptons look very nice and fold smaller, which is nice. Over the years I’ve become a fierce Birdy proponent myself. I bought a Birdy Red back in about 2003, rode it through the present and have loved it literally to pieces. But I am fickle. Or is it open-minded? After the stem and seatpost both broke on me (during the same ride in 2015), I went out and bought a Brompton. I wanted to see how the other half lives. It seemed good to me on a test ride, but after riding it 10 or 15 miles, I had had enough. The riding position was too upright and the frame not stiff enough for my taste. I ended up replacing the broken parts on the Birdy and am saving for a new one. I sold the Brompton on Craigslist at a bit of a loss. Thanks for the nice comparison. Is my finding this page an example of how the internet encourages us to seek confirmation of our biases? Cheers! Seatpost replacements v cheap on EBay. Rear ends, less so. I’ve had a Birdy and a Brompton: The latter is simply a better compromise between folding size, ridership, convenience (carriage block), and price. Now, if an Alfine 11 + disk brake + carriage block Birdy were available for about £1,500-2,000, it might have more success. Of course, you could build one at that sort of price, for example using a Rhine frame (they build Mk1 Birdy frames, selling in Asia-company seems legit). People have imported Rhines to Europe and North America – I can’t find the links , but will add if I can. You can buy a disc brake Rhine badged Birdy this way in China for about US$1,500. There is also a Taiwanese company building a titanium Mk1 frame – it is not ready yet. can you delete the emailadress from the boxbike adress ? I’m the Brompton dealer in New Orleans and lead tours to Europe in which everyone rides either their own Brompton or one they’ve rented. I mention this because the tours are not supported so guests carry their gear on their bikes (typically in a bag mounted to the carry block on the frame, over the front wheel). With the bike weighted in this configuration, the front end of the bike handles incredibly well, making for an excellent ride. Therefore, the Brompton becomes a comfortable long-distance tourer that can easily be taken on mass transit at a moment’s notice, rolls easily when folded and fits in the overhead bin of commercial aircraft. I have ridden Birdy’s & Bromptons. I’ve also toured the factory in Taiwan where Birdy’s are made (Pacific Cycles) as well as the Brompton factories (old & new) in London. For both brands, there’s a high-quality standard. While both of the bikes fold, they’re apples and oranges. Essentially, if you want a folding bike for the city, order a bespoke Brompton the way you want it with a variety of choices regarding color/finish, gearing, ratio, seat post, stem/handlebar, lighting, luggage, carry cases and more. Birdy does make superior performing small wheel bikes but they fold larger, only roll when folded when you buy the extra parts and are not bespoke-built. The deal killer for us though is that there is no Birdy distribution network in the USA. In other words, our shop must import them directly from the factory. By US law, this makes us the “manufacturer” for liability purposes. Thus, if we imported a Birdy and that customer was injured on their Birdy, they cannot sue Birdy. They would sue us! The law may not work this way under similar circumstances in other countries but the result for us is that it’s too risky to sell the product, as wonderful as it is. vielen Dank für ihre Email und ihre Gedanken zu unserer Marke. Was der Händler wohl nicht weiß ist wie unser Ansatz in den USA ist. Was er zu der art des Imports schreibt entspricht durchaus der Rechtslage. Allerdings fokussieren wir uns in den USA Komplett auf den Vertrieb von Ebikes und haben hier ein Modell in dem wir weiterhin der Importeur sind und keine Gefahr für die Händler besteht. Das Thema Birdy ist etwas komplexer. Es gibt eigentlich zwei Arten von Birdys. 1. Das Birdy dessen Rahmen von Pacific Cycles kommt, allerdings komplett in Deutschland bei uns im Werk gebaut wird. 2. Das Birdy dessen Rahmen von Pacific Cycles kommt aber auch bei denen in Taiwan im Werk gefertigt wird. Wir haben bis zur letzten Saison unsere Birdys ebenfalls in den USA Vertrieben, haben den Vertrieb aber bewusst im August diesen Jahres eingestellt, da wir uns außerhalb Europas zu 100% auf unsere E-Bikes konzentrieren. Alle Birdys die außerhalb Europas Vertrieben werden, sind deswegen ausschließlich Birdys von Pacific Cycles und haben außer dem Rahmen nichts gemein. Die Entscheidung wie diese Räder also in die USA gebracht werden obliegt deswegen komplett Pacific Cycles. Wir bedanken uns trotzdem für ihre Gedanken und wünschen ihnen ein schönes Thanksgiving.